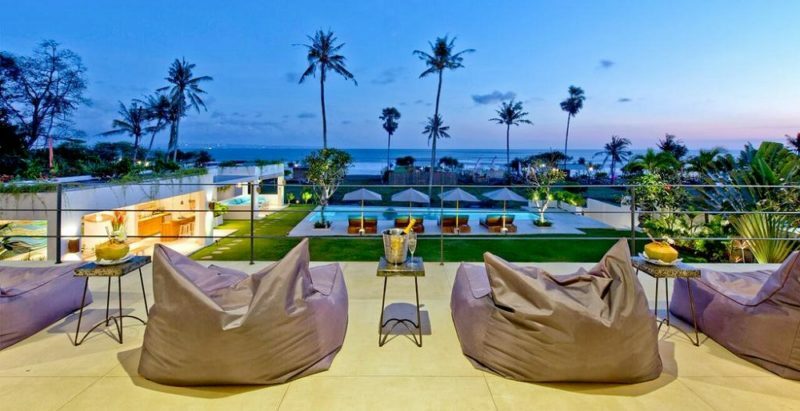 Villa Shaya is a new oceanview 5-bedroom luxury villa in Canggu, Villa Shaya offers the ultimate island living amidst minimalist luxury and privacy. 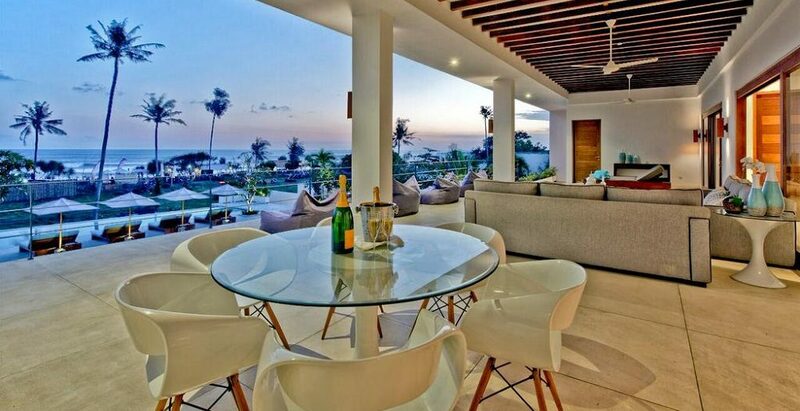 This sophisticated and contemporary villa is all about style; a modern combination of cosmopolitan meets tropical paradise presents itself through wide open spaces, clean lines and beautifully decorated interiors. Immaculate white-on-white on turquoise gives a subtle touch of colour and that beachy island vibe. Expect pristine panoramas of the Indian Ocean from every room. Berawa Beach is visible even from the villa’s expansive entryway – and it beckons from every angle; through the villa’s indoor and outdoor living and dining areas, from all five stylishly decorated bedrooms. 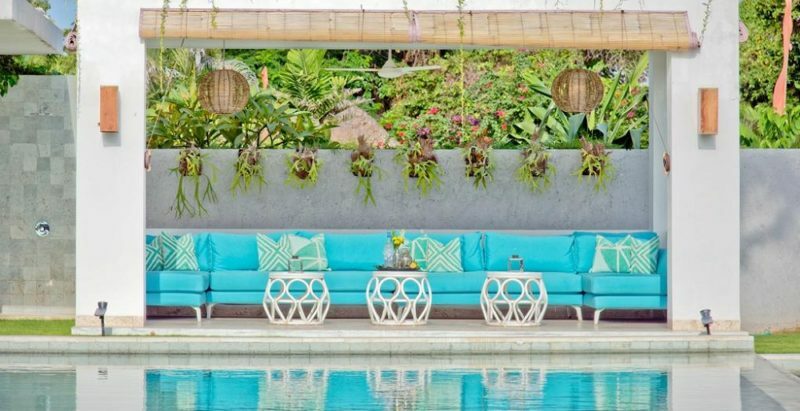 With an unbeatable location right on Bali’s famous Berawa Beach, guests will find the ultimate setting at Villa Shaya – it’s all about fun, excitement and celebration for friends, couples and the whole family. 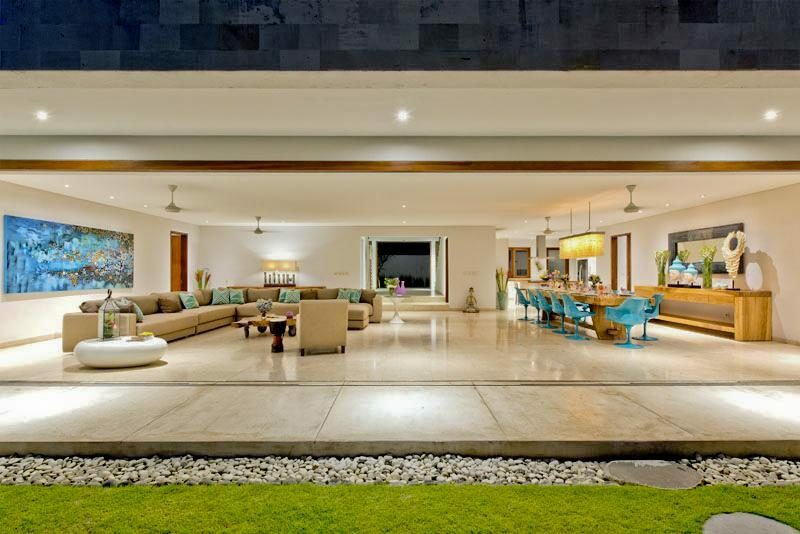 This beautiful new 5-bedroom ocean view villa in Canggu is excellent for those looking to live it up on the Island of the Gods. The villa’s expansive balcony / terrace overlooks the villa’s lush green lawn and stunning infinity pool. It comes with a bar and is the perfect spot for cocktails and a pre-party. Relax with a refreshing glass of wine while the kids enjoy fun time in the pool or on the beach. Enjoy a massage while our trusted babysitters can keep an eye on the little ones for you. Then indulge in al-fresco dining next to the stunning infinity pool and the waves of the ocean. It is so easy with a team of staff to serve you and your guests; so just relax, unwind, dine and dance to your heart’s content, and who can resist a tipsy dip in the pool when the heat gets on. 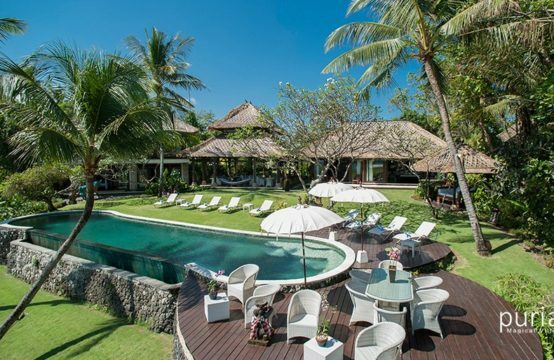 Villa Shaya is located in the heart of it all, right on one of Southwest Bali’s most popular and celebrated beaches. Famous among surfers for its amazing waves, with beachgoers for its incredible sunsets, you’ll enjoy easy access to beach bars, local warungs, restaurants and Finn’s beach club. Never a dull moment, Villa Shaya is one of the very few luxury villas in Canggu with views of the Indian Ocean and its own private access to Berawa beach that is filled with beachside bars and seaside shacks serving drinks and on certain nights, lively music to liven up your evenings. The bedrooms at Villa Shaya are a peaceful respite, the perfect starting and resting point for a comfortable, luxurious and personal experience. All five bedrooms cultivate restfulness, your own haven of serenity cocooned in classic and contemporary island style with touches of inspired enhancements that give each room its very own unique detail. 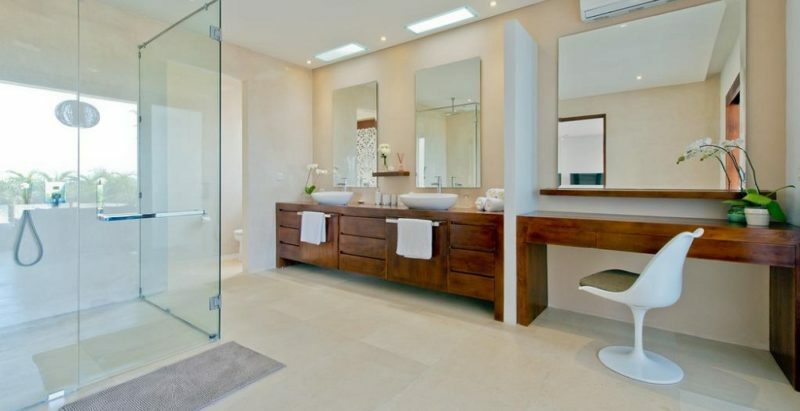 Rest with all the comforts of home at your fingertips, from the latest in technology to exclusive bath amenities. Two bedrooms on the ground floor are discreet retreats commanding an expansive 41,5 square meter on either side of the villa. 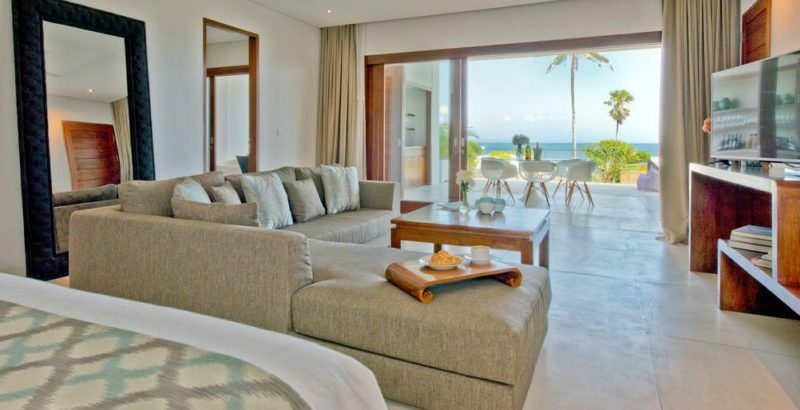 Wall to wall glass doors opens directly onto a private terrace with direct access to the lush tropical garden, infinity pool and views of Berawa Beach. The rooms come with a spacious living area, TV, DVD, WiFi, expansive closet space and an oversized bathroom, with a broad vanity and large mirrors, a glass-enclosed walk-in rain-shower and a bathtub. Blackout drapes keep the bright Bali sun out, ensuring peaceful, undisturbed sleep no matter the time of day. There are three bedrooms upstairs, accessible by a sweeping double staircase located on either side of the entryway. The mezzanine at the top of the stairs overlooks an expansive outdoor lounge/living area that comes with a bar, sofas, sun beds and breathtaking views of the entire garden, infinity pool and Berawa Beach. The master bedroom occupies half of the top floor and comes with its own adjoining living area. You will be impressed with the oversized bathroom, with large mirrors, a glass-enclosed walk-in rain-shower and a private exterior bathtub on the balcony. 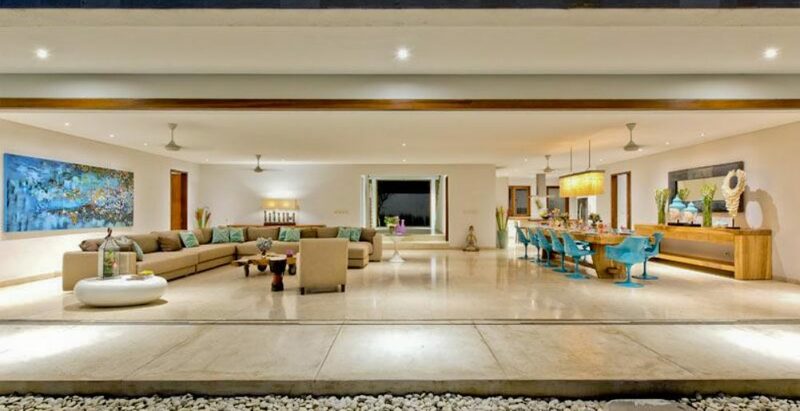 Wall to wall glass doors gives you spectacular panoramic views of the infinity pool and Berawa Beach that opens up to the outdoor lounge/living area. 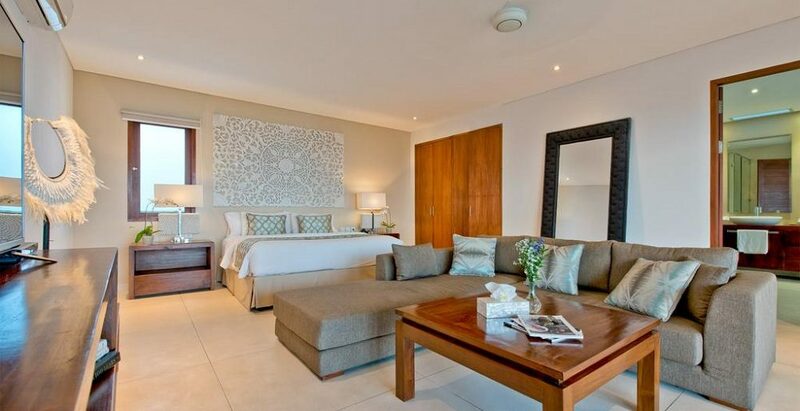 Two extra bedrooms are located across the hall, both with unique touches that still reflect the villa’s overall cosmopolitan beach theme. All bedrooms are elegantly efficient sanctuaries, featuring luxurious pillow-top King Koil mattresses, blackout drapes for an atmosphere of peacefulness, and panoramic views of the ocean. Villa Shaya’s indoor and outdoor living and dining areas set the stage for an impeccable day of entertaining with family and friends. Great for intimate get-togethers and cosy dinners, dine or lounge indoors while looking out to the stunning lawn and the infinity pool bordering Berawa Beach. Glass doors let in plenty of natural light and ocean breeze or keep them closed for air-conditioned comfort. The kitchen is just a comfortable few feet away for easy access to gourmet meals, takeouts or home-cooked recipes. In the charming tropical garden, the outdoor lounge and dining area is perfect for a day of fun in the sun. 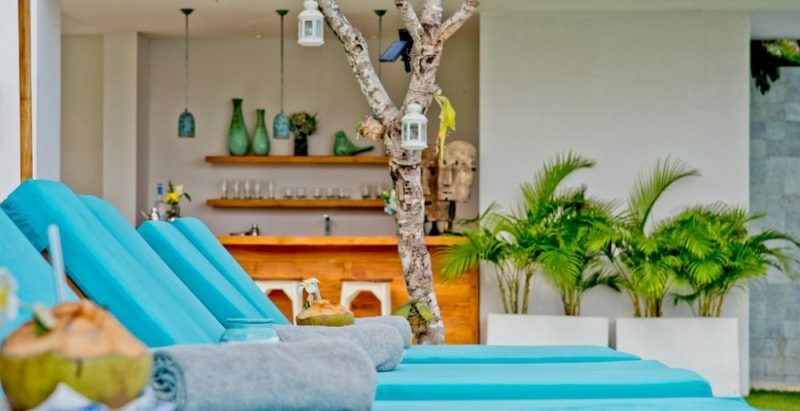 Relax on sofas or enjoy a BBQ meal or a healthy lunch as the bartender brings you an exotic cocktail, smoothie or a refreshing juice from the adjoining bar. Feeling the heat? A few steps away, cerulean blue infinity pool sparkles in the sun, providing a cool and refreshing respite from the island heat. Wind down after a meal at one of the many sun loungers or just float around on a floatie! Both indoor and outdoor living and dining areas at Villa Shaya can cater for large groups of people with tables that can seat up to 12 guests. The 16-metre infinity pool at Villa Shaya is perfect for a day out in the sun or a quick and cool respite from the heat. There are plenty of sun-loungers and umbrellas to accommodate large groups or find tranquility with a little personal time on a floatie. 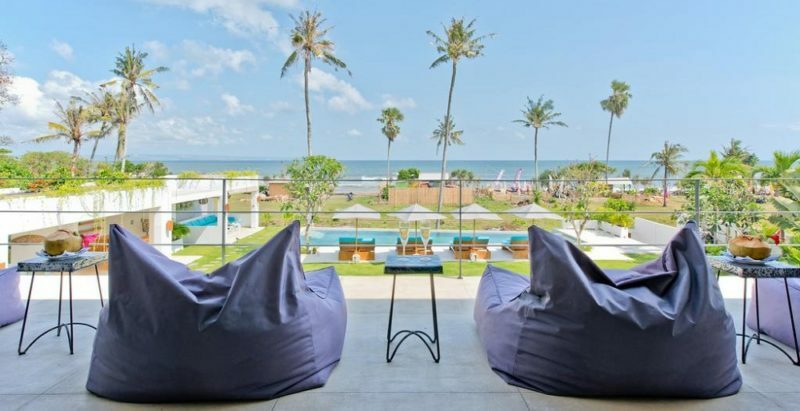 You’ll be impressed with the scenic view of Berawa Beach from your perch. This sparkling beauty is conveniently located right in the center of the Villa’s lush green lawn and garden for maximum sun and sea breeze. Steps away, there is an outdoor bar, dining area and sitting area with easy access to cocktails, ice-cold beers, champagne, bites and comfortable shaded seats to relax in. When you can no longer resist the call of the waves, take a walk to the beach via the villa’s private beach entrance and dive right in! 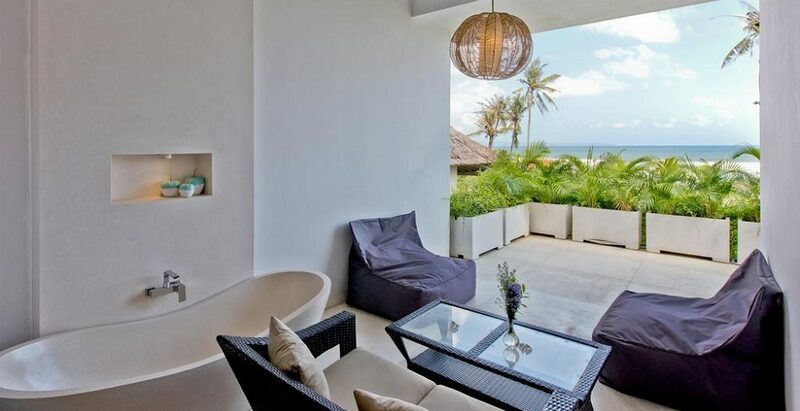 The balcony at Villa Shaya is a vast and impressive lifestyle space overlooking the garden and Berawa Beach with its very own bar, a six-person dining table with chairs, sofa sets and coffee tables. This is the perfect space to relax and take in the villa’s grounds and surroundings at any time of the day including sunrise or sunset. The space was created for relaxing, socializing and to simply be. 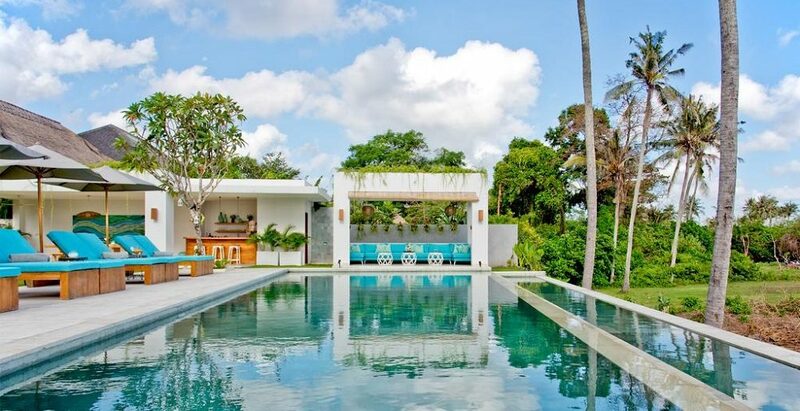 Enjoy intimate gatherings over cocktails and canapés, read a book in the sunshine and the breeze, take a nap, meditate or practice yoga in this incredible space that promotes tranquility and balance overlooking into nature. Tucked behind the indoor living and dining area at Villa Shaya is the modern guest kitchen that comes with a large central island where family and friends can gather for breakfast or keep jovial company while cooking up a favorite recipe. There’s plenty of amenities for a seamless kitchen experience including stainless steel kitchen wares, a large refrigerator and freezer, hot and cold water cooler, gas stoves, pots and pans, plates, glassware and silverware. 5 bedrooms with double beds. 2 bedrooms can be converted into two single beds. Sleeps up to 10 pax. The 16-metre infinity pool at Villa Shaya is perfect for a day out in the sun or a quick and cool respite from the heat. Villa Shaya’s indoor and outdoor living and dining areas set the stage for an impeccable day of entertaining with family and friends. Breakfast is provided. Lunch and dinner can be arranged at extra costs. The kitchen is available for those who prefer to cook their own meals. Complimentary coffee, tea and mineral water are also available. Villa Shaya features a FAR Infrared Sauna for your personal use throughout your stay. In-villa spa sessions can be arranged at an extra cost. Treatments can include massages, body scrubs, cream baths for hair, manicure and pedicure. The friendly and enthusiastic team of staff at Villa Shaya are always ready to ensure that guests are enjoying a truly memorable stay. Efficient and discreet, staff members are on-site every day from 9am to 5pm including a very helpful Villa Manager. WiFi internet access; complimentary local calls, full 3G mobile phone coverage. Satellite TV and DVD Player in every room. Private yoga sessions available in-villa at an extra cost. Villa Shaya is perfect for celebrations, birthdays, anniversaries, retreats and small but stylish weddings for up to 100 seated guests.